Discussion in 'Vegas Trip Reports' started by Txvp15, Jun 13, 2016. - New member here planning to give a live TR a shot, so please bear with me if there are any issues posting via Tapatalk. - This trip will be my 4th straight trip to downtown during the summer (8th trip overall). Each summer, my wife and I and various family members on my wife's side of the family spend a few days in downtown. Over the years, the group has evolved to include family friends as well. This year's group will consist of about 15 people. - For the summer trips, we always book our stay at the Golden Nugget since we typically will all pitch in one of the days to rent a couple of the cabanas in the pool area. With the limited number of days that would work for a large group of people, we did have to settle on higher than average room rates at the tail end of this trip. The flight cost ended up being the lowest we've ever paid for a midweek morning flight to Vegas, about $80 per person round trip from DFW with a checked bag each way, so that helped absorb some of the higher room rate costs. - The amount and variety of gambling within our group is all over the map. Since I like to spend the majority of my time gambling, that will be the TR's main focus. I'm almost exclusively a $0.25 level and lower video poker player, but will occasionally play blackjack or craps if I feel like I need a change of pace. This trip, I'll likely be sticking with JOB, NSUD and BP, so there will be a lot of time spent gambling at Four Queens and the Boyd properties. Since I do play at a lower level and typically spend 12+ hours each day gambling, I do always split the trip bankroll by day and session. If I have a rough stretch during a session, I move down in denomination once I reach a certain level. For example, if I start out with 1000 credits at the $0.25 denom, I will switch down to the $0.10 denom once I reach $100 remaining on the machine (ie, 1000 credits at the $0.10 denom). I'll repeat the same process from $0.10 to $0.05 denom if need be, but of course, my hope is to be able to play at the $0.25 denom the whole trip (wish me luck!). Partial pool day at the Golden Nugget. Cabana rental is charged by the day (roughly 10 AM - 6 PM), so our group can come and go as they please. This trip, I'll likely be sticking with JOB, NSUD and BP, so there will be a lot of time spent gambling at Four Queens and the Boyd properties. I move down in denomination once I reach a certain level. Four Queens and Boyd, great places for VP. Hate to see you move down from quarters, I'm guessing it's gonna kill the paytable. Might make more sense to lower the number of quarters per hand. Looking forward to the live TR. Thanks for taking us along. There will definitely be lots of time spent at the Boar's head bar at MSS and at the uprights in the 4Q. There are a few machines inside the California that have NSUD at the $0.10 and $0.05 denom, and I believe the 4Q does have 8/5 BP at the $0.05 denom. So, if things do go south at the $0.25 level, I'll try my best to stick to the best pay tables. This trip, conserving bankroll and maximizing play time are the primary objectives, so that's why I'm sticking with the games with lower variance. Looking forward to this. Hugo's Cellar is awesome. Enjoy! Thanks! Any recommendations for what to order at Hugo's? Excellent rib eye, with a nice bottle of Cabernet. I loved it. Have a good trip! Perhaps we'll run into each other at Boar's Head, as our trip dates overlap. Maybe! I'll be there tomorrow for sure. Best of luck on your trip! Packed and ready to begin the journey in the morning. Doing a last minute check on VPFree2.com to make sure there haven't been any VP machine changes since I checked there last. Prior to last summer's trip, the D removed the $0.05 Loose Deuces game and the 10/7 DB machines 3 days prior to arrival. I would stick with steak or shrimp but not the stuffed shrimp. I typically like crab cakes etc. but not a fan of crab anything at Hugos. Chicken has been overdone when people have ordered that. Chicken at Hugos? I know. Why would you ever? Steaks are great. We played them in February. They are near the Mega-Bucks machines. They've got some lined up back-to-back. I hit on one that faces the Mega-Bucks, May 5th last year, even got my scratch card. Ubered to the airport waiting for the plane to board. Photos aren't working on tapatalk right now. Replies aren't working on tapatalk right now. Ty, thanks for letting me know. I'll check when I get there today. Good luck! If you're looking to play a good VP game for cheap, another option is to 1-coin the 99.95% Pick 'em (Pick-A-Pair) games at Fremont. Paytable looks like this, and is 99.58% at 1-4 coins. Also has pretty low variance as well. Can you play JoB strategy on these games? No, the format of the game is very different. You have 2 stud cards and 2 packets of 3 cards with one of those cards in each packet dealt face up. Then you "pick" which packet you want to complete your hand and your hand is evaluated. Here is a description of the game and the full pay strategy linked below. If one short coins the game, I would hold a high pair (9s or better) over all 3 to a Royal. 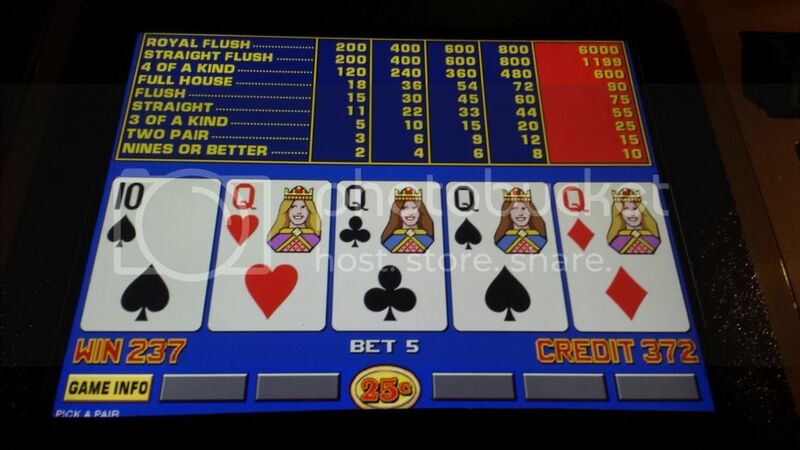 Frugal Video Poker is a free PC trainer that has the game available. It's not that difficult with a little practice. Still getting an error when trying to do a reply via tapatalk, very frustrating... I'll have to just wait until I have my laptop to reply and do a trip recap but I'll post at least once each day. Good day so far - arrived around noon and got settled in. Been bouncing around between the boars head bar and the California alcoves with various people in our group. Did find the upright $0.25 JOB at MSS but hate where they've moved them. They are literally next to the entrance from Main Street and there's no air vents right there - very toasty! One of the ladies in our group hit a royal on the slant tops at MSS playing $0.25 JOB - same machines she hit on last year. Lost about $150 so far playing $0.25 JOB, 5 scratch cards. Feels good to be back in Vegas! Also had Hugo's tonight for dinner, excellent. Ended up going with the filet. Many in our group are partial to binions steakhouse and have sentimental values / memories there, but did enjoy it. We did feel it was a bit long to get through the dinner, but we had a large group. Congrats to her, hopefully the first of many royals for the group!